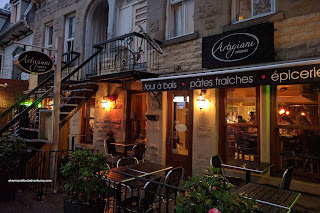 After dining on Cantonese food the night before, we decided to deviate from the "must eats" in Montreal as found on the internet and from various recommendations. Yes, as much as it is a good thing to follow a framework of sorts when dining in a particular city, sometimes we just have to eat something we want. That would mean that it may never be on the radar for a visitor nor would it be hyped-up either. 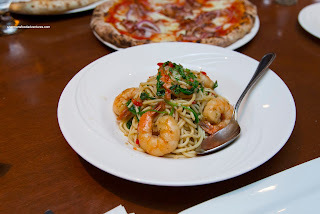 We went for Italian at Artigiani Pizzeria Ristorante as the kiddies love it as much as Chinese food. Due to a sudden and heavy rainstorm, we ended up being soaked head-to-toe despite only walking a block and a half from Mont Royal Station. 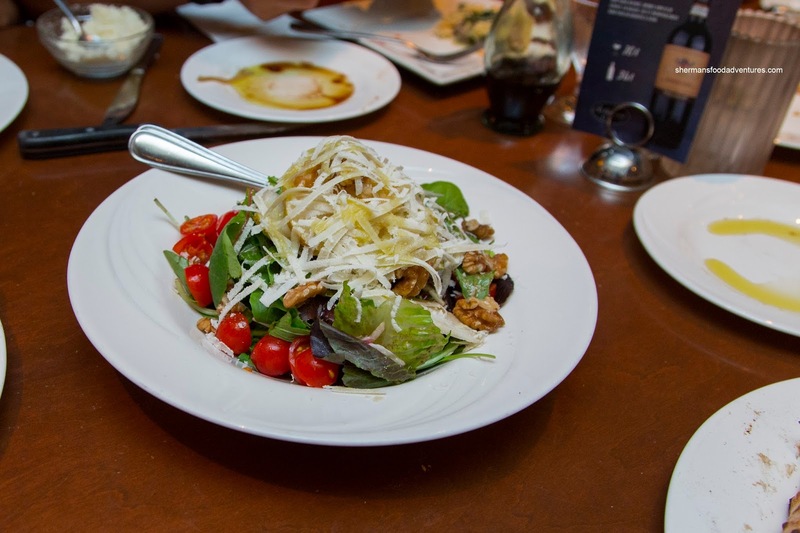 Since we were in dire need of anything green in colour, we shared the Insalata con Pere e Formaggio consisting of mesclun greens, pears, Grand Padano cheese shavings, walnuts and honey. This substantial salad was a nice mix of sweet, salty, tangy and umaminess (from the cheese). I particularly liked the ripeness of the pears as they were soft and sweet. 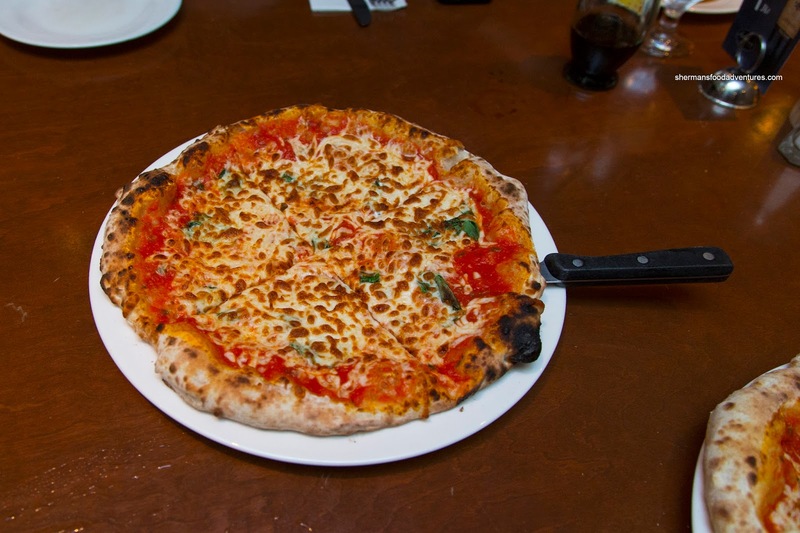 Costanza's 2 boys both went for the Semplice pizza with tomato sauce, mozzarella and fresh basil. This featured a thin and crispy crust that had a decent amount of leoparding. The abundance of fresh basil was aromatic and impactful. For my son, he originally chose the ravioli, but that was before he noticed that there was something evil in the ingredients (it was spinach...). 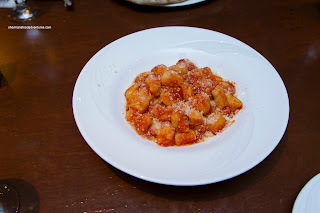 So he had the Gnocchi al Pomodoro instead. He quickly gobbled it up and it was no wonder as the sauce was thick and rich, yet not overly acidic. There was a certain mildness that allowed the natural sweetness as well as the fresh basil to come through. The gnocchi was texturally on point being tender with a nice rebound. For my daughter, she chose the Tagliatelle al Funghi Trifolati which was also very good. 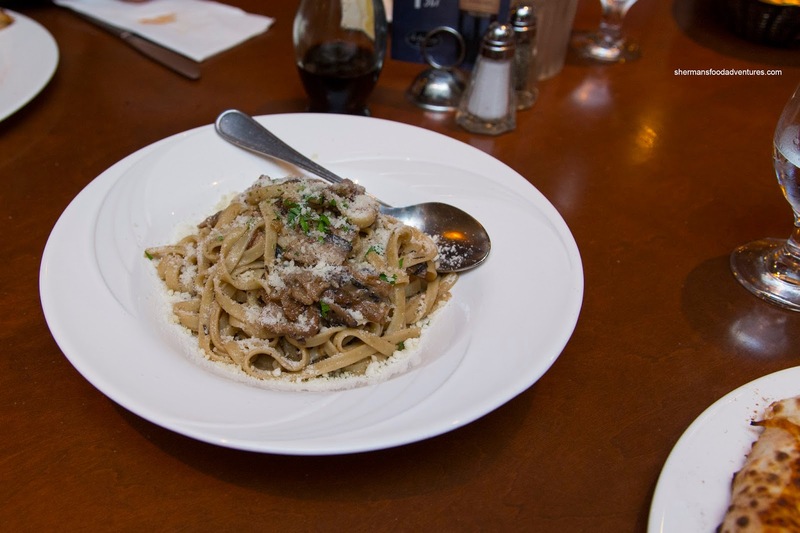 Firmly al dente, the pasta was tossed with a mix of wild mushrooms and just enough truffle oil so it wasn't overpowering. The dish was flavourful and Earthy. 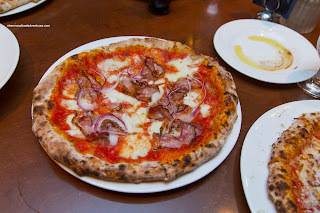 For the adults, we shared 2 pizzas including the Pancetta with red onion. Due to the liberal amount of light tomato sauce, the middle of the pizza crust was soft and wet. Despite this, the pizza itself fine with tender slices of pancetta and pungent red onion. I would've liked to see more saltiness to counteract the amount of moisture though. For Viv and I, the Artigiani pizza was better as the crust remained crisp and chewy throughout. 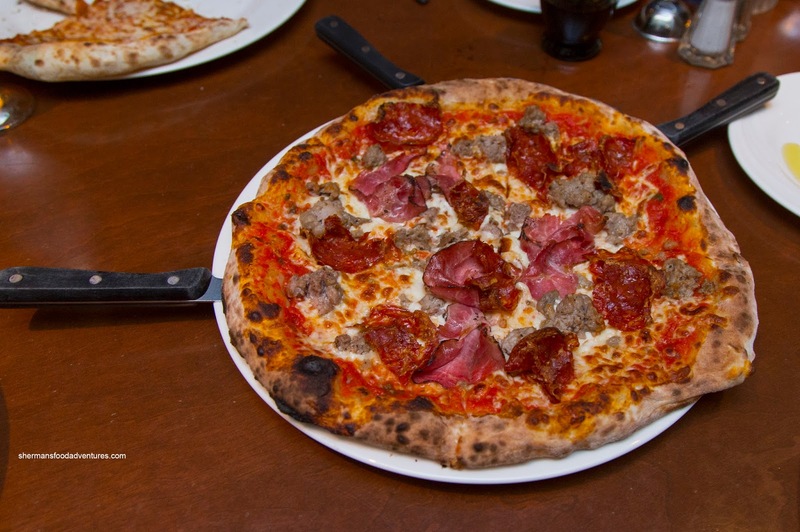 On top, there was a substantial amount of meat including capicollo, sopressatta and Italian sausage. This surprisingly didn't soften the crust, but it added plenty of body and flavour (including a salty zestiness). We also got 2 more pastas starting with the Rotini con Spinacci e Salsiccia. 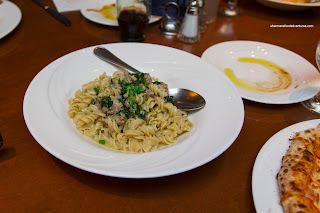 This sported a little past al dente rotini laced with garlic, white wine, spinach and sausage. Hence, there was no shortage of different flavours that were aromatic and only lightly salty. I found the big chunks of meaty sausage quite appealing where it helped add a robust angle to an otherwise light-tasting pasta. Lastly, we had the Spaghetti con Gamberi e Rucola that boasted large meaty prawns (which were beautifully prepared). Interestingly, the dish didn't eat as flavourful as it appeared. Despite the addition of arugula and white wine, I found that there was little in the way of distinguishing flavours.